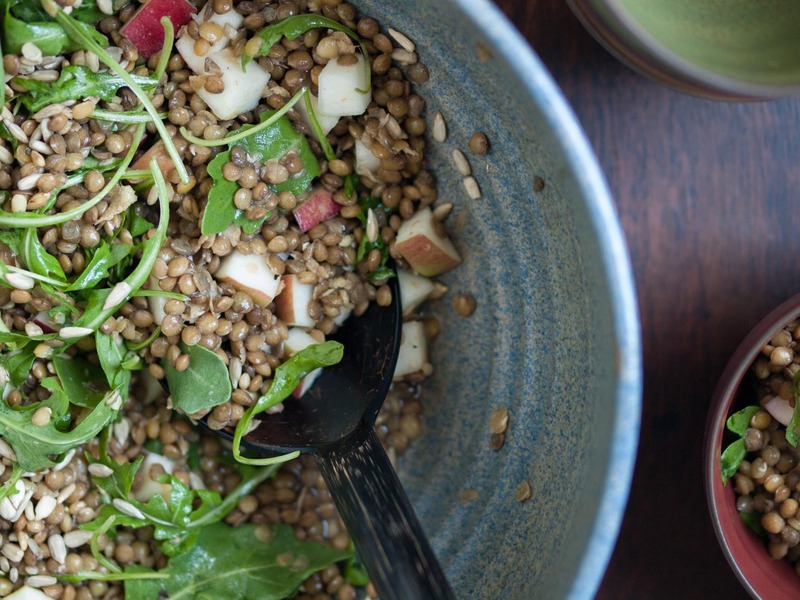 Here, hearty lentils, crisp apple, arugula, and sunflower seeds are tossed in a zingy ginger orange dressing, making for one very flavorful salad. It’s basically fall in a bowl. And it’s good for you. 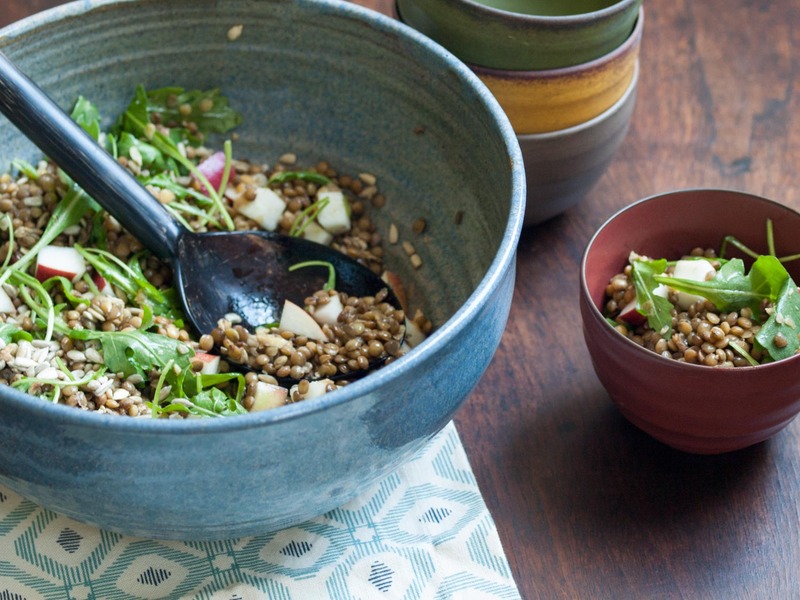 Relatively inexpensive and a great source of protein, iron, folate and thiamin, among other nutrients, lentils are no doubt one of those foods that we all should probably be eating more of. On top of that, they’re easy to make. In her wonderful (highly recommended!) cookbook My New Roots, Sarah Britton writes that she presoaks all legumes, even split peas and lentils, because it helps make them more easily digestible and decreases the active cooking time. I’ve tried her method a few times now, and must say that I am absolutely a believer. Adding a sheet of kombu to the cooking pot further aids in making legumes easier to digest. Lentils minus the, um, side effects? Sign me up! *To make this salad more of a meal, serve with something grainy– quinoa, wild rice, and farro are all good choices– and/or some crusty bread. Roasted beets also make a nice addition. Optional: Before cooking lentils, soak them in hot water with a bit of lemon juice or apple cider vinegar. I soaked mine for 5 hours. Place lentils and kombu (if using) in a pot, and cover with about 2 inches of water. Bring to a boil, then reduce heat and simmer, covered, until done (but not falling apart). If you’ve presoaked your lentils already, this can be as quick as 10 minutes. If not, it might be closer to 30 or 40 minutes. So be sure to keep an eye on them and check regularly for doneness. Drain (and discard kombu), give a quick rinse, then toss with apple cider vinegar and season with salt and pepper. Let cool completely. 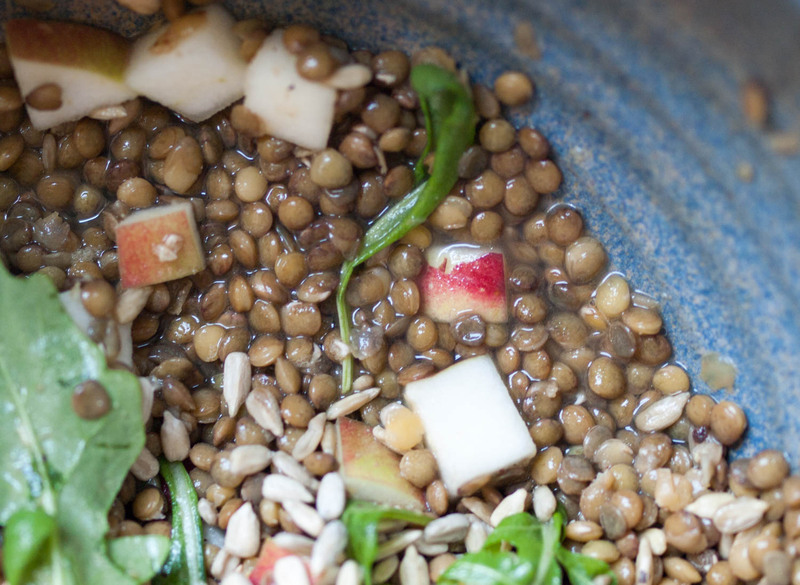 Toss lentils with the dressing, arugula, apple, and sunflower seeds. Serve at room temperature. This entry was posted in Salads and tagged gluten-free, vegan, vegetarian on October 24, 2015 by Sarah.